Peaches are one of the nation’s most beloved rock fruit, but it’s not always easy to know when a peach should be harvested. 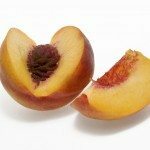 What are some of the indicators that it is time for picking peach fruit? Another question you may have is how to pick peaches correctly. Read on to find out. Before even thinking about harvesting peaches, I hope that you have planted and cared for your peach tree correctly for optimal production. First off, when you bring the tree home from the nursery, open the wrapping from around the roots and soak them for 6-12 hours. Then plant your tree in soil that has been pre-prepared, raked to remove stones and debris and with a pH of 6.5. Set the tree at the same depth it was planted at the nursery and work the soil in around the roots. Tamp the soil down to remove air pockets. Water the tree in well. Mulch around the base of the trunk to aid in water retention and retard weed growth. Peach trees should be pruned with an open center system of pruning, which will allow the sun to penetrate and improve air circulation. Keep the tree free from disease, insects and birds. Fertilize the peach with 1 cup of a 10-10-10 food in March in a 3-foot area around the tree. In June and early August, broadcast ½ cup of calcium nitrate over the 3-foot area. In the tree’s second year, fertilize peaches twice a year in early March with 1 cup of 10-10-10 per year of tree age. Then at the first of August, apply 1 cup per year of the tree of calcium nitrate. Now that you have a healthy peach tree, it’s time for the best part, peach tree harvesting. The exact time to pick peaches is determined by the cultivar, but generally they are harvested from late June through August. Color is a great indicator of maturity. 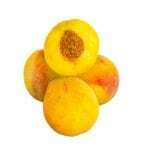 Peaches are ripe when the ground color of the fruit changes from green to completely yellow. Some of the newer peach varieties have a red tinge to the skin, but this is not a reliable barometer of ripeness. There is a fine line when harvesting peaches. You want the fruit to hang on the tree long enough for the flavor and sugar content to peak, but not so long that it becomes overripe. Overripe fruit reduces storage time and increases the possibility of disease, insect and bird damage. Also, peaches will ripen in color, juiciness and texture off the tree, but will lack in flavor and sweetness. The best indicator of the correct time for picking peach fruit is a taste test. Although lesser in flavor, slightly under ripe fruit can be harvested and ripened indoors in a paper bag if there is an immediate need to harvest due to weather. Clingstone or canning varietals are harvested when the fruit slips freely from the stem. Peaches are not only delicious, but a great source of fiber, niacin, potassium and vitamin C. Once harvested, they will keep in the refrigerator or other cool area (31-32 degrees F./0 degrees C. with a 90 percent humidity) for about two weeks.